When shipments spill from trucks, the debris creates dangers for the driver and every vehicle near the truck. A recent Tennessee truck spill, reported by News Channel 5, is just one example. The news station reported that paint thinner spilled from a pickup truck traveling on I-40. The chemical spilled when the truck rolled over. HAZMAT crews had to be called to the scene to clean up the paint thinner. Traffic in the righthand land came to a stop while crews attended to the spill. Thankfully, no one was hurt – but had the pickup truck been a commercial truck, things could have been very different. Hazardous chemicals can do serious damage to roadways and to people. The chemicals could have leaked into the groundwater. Other drivers could have inhaled the fumes (since they were stuck in that area for a while). Paint thinner is particularly corrosive, and if tons of it had leaked, this might have turned into a very different story. We’re grateful that everyone turned out to be just fine. Trucking companies sometimes overload their trucks so that they can ship more inventory – and thus make a bigger profit. Many truck companies also rush to get their rigs and semis on the road, and don’t always take the necessary steps to secure the cargo. 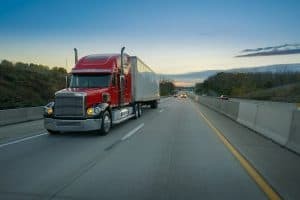 Commercial trucking companies are required to follow federal safe shipping regulations mandated by the Federal Motor Carrier Safety Administration (FMCSA). Truck businesses should follow safe commercial trucking practices. They must also take reasonable precautions such as being prepared for inclement weather. All materials used to secure the cargo must be in good working condition. Chains, ropes, strapping, and webbing must meet manufacturer quality standards and must be used according to manufacturer best practices guidelines. Tiedowns should be used to prevent cargo from shifting or becoming loose. When cargo isn’t properly secured, the driver can lose control of the truck. Different rules may apply to different types of cargo. There are some rules that apply to all types of shipments. There are specific rules for certain types of commodities because some cargo – such as liquids, sand, and aggregates – is harder to secure than others. There are special rules for securing hazardous and toxic materials. The federal rules include limits on load quantities and on requirements for how shipments should be braced. Tennessee also has its own truck safety regulations. Improperly secured cargo can cause the driver to lose control of the vehicle. The vehicle may roll over. It may veer into the wrong lane. The debris can crack the windshields of other drivers, or cause crashes between other drivers who are swerving around loose debris. If the truck is traveling downhill or around a curve, it can lead to a serious truck accident. The driver. The driver is liable if he/she contributed to the improper loading of the cargo. The driver is also liable if he/she was speeding, ran through a red light, or directly contributed to the accident. The truck manufacturer. If the cargo shift was related to a defective part of the truck, the manufacturer may be held accountable. The same goes for the manufacturer of any straps or cords used to hold materials down in an open-topped truck. At the Rocky McElhaney Law Firm, we are ready to help you get justice. Our Nashville truck accident lawyers work to show that the overloaded or improperly secured cargo was the direct cause of any injuries or fatalities. Our firm has offices in Nashville, Hendersonville, and Knoxville, Tennessee. To make an appointment, please call us at 615-246-5549 or use our contact form. We fight for you!